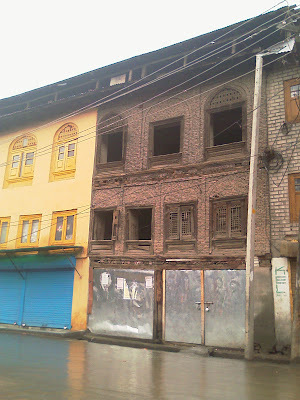 A compressed dwelling on a rainy afternoon, situated in the downtown locality of Srinagar..
A contrast of couple of heritage houses.. Undoubtedly, Old is Gold indeed!! He saw his mud house getting washed away in flash floods. He saw his father pushing cart at Amira Kadal and took snap of him. He saw his family having no money for burial of his father. Not very literate but educated enough, Danish Ismail, is one of the brilliant photo-journalists of Kashmir who is working with the international news agency Reuters. He also works as photo-editor in Kashmir Speaks. Immensely talented Danish has, many a time, won laurels for being one of the best photo journalists of Kashmir . Hailing from an economically poor background Danish, who once could not afford to buy his school-uniform, today rubs shoulders with the elites. He carved a niche for himself and succeeded to achieve great triumphs in life. He has proved that one can achieve the zenith of one's desires by dint of hard work and dedication. For him, qualifications matter little. 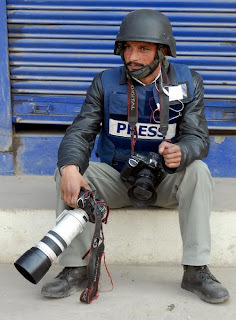 It is hard to believe that Danish Ismail, the household name in Kashmir and internationally renowned photo-journalist is not even a matriculate. Ask him why he left studies; he cites 'poverty' as the reason for giving up his studies just after 9th standard. But he continued to struggle and worked hard to achieve the position where he stands today. Born in Syed Kocha Dobi Mohalla Batamaloo in Srinagar , 28-year- Old Danish did his schooling from Islamia Model School Batamaloo, an Urdu medium school. Danish divulged that Riyaz Masroor, who is at present executive editor of the English daily The Rising Kashmir , has been his teacher. But destiny didn't allow Danish to carry on his studies. His childhood aim was to become a bus driver. His father, Muhammad Ismail Wani, was a labourer and "was unable to earn more than 40 or 50 rupees a day. Danish revealed, UI was not able to deposit my fees in time. So I decided to help my family out." in the early nineties, Danish, a student of 8th standard joined a Printing Press and worked there as a press representative earning rupees 200 per month. Besides he was provided a motor-bike by the same Printing Press. But severe financial crisis compelled him to leave his studies. Talking about their condition in his childhood years, Danish said, "Our house was made of mud. The only room of the house was partitioned into two parts—one side would serve as kitchen and the other as bed-room and drawing room. On one fateful day, harsh realities of life dawned on us when a heavy rainfall damaged our house and rendered us homeless. That time I was in 3rd standard". Danish is thankful to his neighbours who came to their rescue and offered them shelter for many months till they reconstructed their own house. Danish owes a lot to Zahir-ud-din Bhat, Editor-in-chief, Etalaat, who provided him financial help even in his school days. According to Danish, Zahir-ud-din, the then Executive editor of Greater Kashmir, proposed that he should work as a photographer for the same newspaper. So he joined GK in 1997 as a trainee photographer. "Since I had no camera, I just used to observe how to become a perfect photographer, and gradually I learned the art of photography Danish shared. Danish is grateful to Habib Naqash and Sajjad Hussain, the senior Photo-journalists for guiding him all time. Few months after joining GK, his brother who was working as a sales-man at a shop in Batamaloo, borrowed Rs 8000 from his Manager. He bought a camera/ flash and camera-bag for Danish. There was no digital photography then. Simple black and white pictures developed by using developer and fixer used to be published and the pictures were pasted not computerized. Danish recalled, "My first picture published in GK depicted Child Labour in the state". For two years, Danish worked as a volunteer Photographer. He was only being provided three film-roles and pay for developer and fixer for a week. After two years, he started getting Rs 300 per month. Then, a year later, his salary was hiked to Rs 1000 a month. However, Danish said, life was not the same as it is now. "Today, Alhamdullilah (Thank Allah) we are living a luxurious life but earlier it was really hard for my father to support his family. Many times we were not able to have two square meals. Now the time has entirely changed." The only difference is that my father left us for good. “Poverty killed him", Danish added with tears glazing his eyes. He tried to straighten up and revealed that his father expired on 9th February 2003, just three days before Eid-ul-Zuha. "I had no money for the funeral ceremony. My brother could arrange only a few bucks," Danish divulged adding, "But thanks to Fayaz Kaloo, Editor-in-chief, Greater Kashmir aid Rashid Makhdoomi, General Manager GK Publications. The duo helped me out financially when I was in dire need". Impressed by his outstanding talent and hard work, Fayaz Kabli, staffer photo-journalist of Reuters, offered Danish a job in Reuters. And it was on 27 May 2003, he joined Reuters as a stringer fetching Rs 1000 per photograph. Danish was asked to use a digital camera. He is thankful to Fayaz Kabli, whom he considers his role model/ for guiding him and teaching him everything/ be it digital photography/ editing/ captions/ computer use or Photoshop. Earlier, Danish would use a Cosina camera with plastic body costing Rs 7000. And, at present/ he uses EOS-1 Mark II Digital which can click 9 pictures in a second. He further disclosed that his total equipments he uses today including camera/ lenses/ etc, cost almost Rs 22 lakhs. According to him. Photography in the earlier days was very different and difficult as compared to the present times. On 29th May 2003/ his first picture went for Reuters (that depicted an Indian army personnel in a vehicle with his service rifle in His hands, and a poster of Sonia Gandhi at his back. Fortunately this picture was published on the front page of Indian Express. 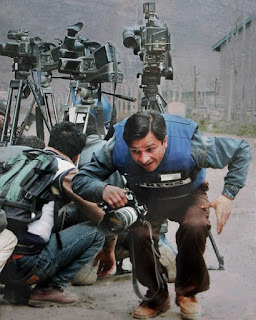 Since then he continued working both with Reuters and Greater Kashmir. Meanwhile, he was also sent to Thailand for training. Danish was honoured with the best picture of the week award in 2007. He again got the same award after few months in the same year. Besides, one of the photos clicked by Danish comes under the World's Best Pictures published by Reuters. According to Danish he has a different style of working. He stresses more on quality rather than quantity. Wherever he goes he is determined to get his work done anyhow. 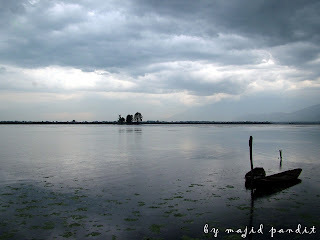 Danish was invited as a Visiting Faculty by the University of Kashmir for delivering a lecture on digital photography. He delivered the same to the students of Mass Communication and Journalism in the year 2007. Today Danish has a command of many languages including Urdu, Punjabi, English and Kashmiri. Though being illiterate, he is able to write captions for his own pictures. Interested in Urdu Poetry and a die-hard fan of Fazil Kashmiri, Danish is a religious minded person. He is now harbouring a dream—to get his two sisters married. When asked if he ever felt an inferiority complex for being the son of a labourer, he smiled, paused for a while and shared, "Once I saw my father pushing a cart on the road. I was accompanied by one of my foreigner friends. I went to my father and helped him in pushing the cart. My father got astonished and asked me not to disclose it that I was his son. When my photo-journalist friend from Japan asked me who he was, I proudly told him that he is my father". Danish believes that it is the blessings of his parents which brought him such fame. He further suggested, if you are obedient to your parents and are determined about your goal, you can definitely achieve great success.